Seafood-based oils are some of the most effective and essential supplements on the market. If you’ve seen the benefits and success of fish oil, you’re on the right track. Krill oil is one example that provides the same benefits to health and wellbeing without the concerns for environmental damage or sustainability. Read on if you’re looking for a high-quality supplement that has benefits to everything from health to performance, as well as examples of the most popular products on the market and which you should look to using! We’re starting with a great product. Sports Research’s Antarctic Krill Oil packs a reasonable 180-200mg of Omega-3 fats from EPA/DHA per capsule. Most of the products on this list require twice as many capsules just to compete with this powerhouse of Omega-3 content. This is great when you consider that krill oil is 150% easier to absorb than fish oil so you need less of it. The environmental standards of the krill oil are also great – a common concern for buyers. The levels of PCBs, Dioxins, Lead, Arsenic and Mercury are all very low at hundredths of the acceptable limit. This means that you’re not likely to run into any problems from persistent pollutants! This is matched with sustainable fishing practices based on MSC certification and CCAMLR accountability. These provide a little more reassurance that you’re using sustainable products for your own health. Some customers have reported receiving ruptured capsules which presents a huge problem to their usage. You can’t take a krill oil capsule if it’s covered in krill oil – you’re very likely to vomit. These quality assurance standards are the only reason we don’t agree with the IKOS (the 3rd party tester’s) verdict of 5 stars! Packs more EPA/DHA into a single capsule than many other brands can with 2! 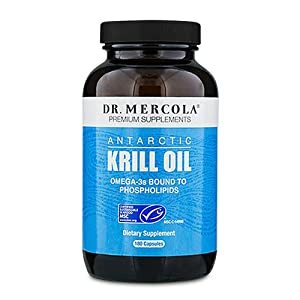 Unlike the previous product, Dr. Mercola Antarctic Krill Oil isn’t 3rd party tested. This doesn’t mean that it’s going to be bad, but it does mean that you don’t have additional assurance on the health or environmental claims that it makes. On top of this, the overall Omega-3 per capsule content is only slightly lower than the Sports Research product – with 175mg of EPA/DHA each. This is a significant concern since now you’re getting less actual benefits for your money, as well as less peace of mind that the product is effectively dosed and danger-free. The potency is low, the manufacturing and fishing practices are unconfirmed, and the cost of this product is much higher than some of the better choices. Overall, we’re giving this one a miss! The content on this product is absolutely awful when compared to other products on a capsule by capsule basis. The overall Omega-3 fat intake is much lower, as is the phospholipids – you’re going to need to take several capsules to keep up with others on the market. 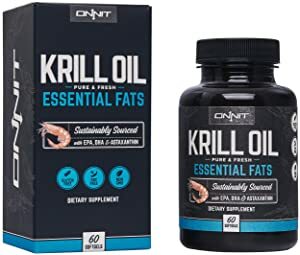 With 140mg overall, this product is falling far short of the overall potency we’d expect from an effective krill oil. This means that each capsule is going to have less positive effects in supporting heart/brain/joint health, as well as overall performance. The actual cost of the product goes way up when we consider the fact that you’ll need two capsules. On top of this, customer reviews have been historically unhappy, though they seem to be getting more positive over time – suggesting that newer batches have removed “fishy burp” problems! There are also no assurances of environmental or ethical considerations, or any discussion of heavy metal content. This product ranges from uninspiring to downright awful! This is an example of a product that looks great until you realize that a serving is two capsules. This is a problem when there are only 30 servings per container and the price costs are significantly higher than others per mg of effective ingredients. The actual doses of a given serving are okay, though for a 2-capsule serving they’re still not massively impressive. Products like the Sports Research krill oil compete with the EPA/DHA concentrations despite being a single capsule. Clearly, there’s not much to put the Viva Naturals product in contention for the top spot. This is even more clear when we see that many customers struggled with consistently broken, leaky capsules. This ruins an entire bottle of products and costs your time and money, all for an inferior product. Given a total lack of discussion on the heavy metals, pollutants, and sustainability, we’re deeply unimpressed with Viva Naturals! 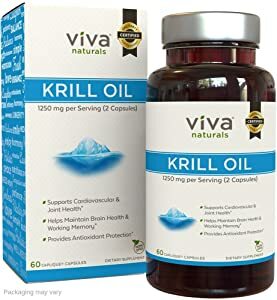 Onnit is a brand with a strong reputation in the nootropic scene, but their krill oil isn’t as potent as we’d like. It doesn’t break the 200mg range for EPA/DHA, even on a serving size of 2 capsules per day. The Astaxanthin content is also very low when compared to other products. This leaves you with less of the long-chain Omega-3 fats you need for best results, as well as a reduced antioxidant content. This is enough to place it squarely behind products like Sports Research or Dr. Mercola. The friends of the Sea accreditation is a vote of confidence to the sustainability of the Onnit practices. However, there’s still no discussion of pollutants and heavy metals – serious concerns for the quality and health effects of a krill oil product! The intent to produce good manufacturing practices tells us a lot about the intentions of a supplement company. 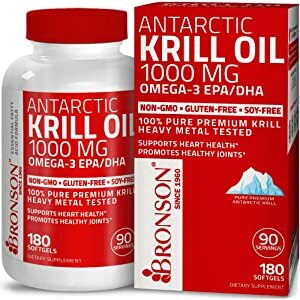 Bronson’s Krill oil is tested for heavy metals through FDA-approved labs to provide a higher standard of product with more concern for your health and safety. It also provides the coveted landmark of 200mg of EPA/DHA per serving. It may be 2 soft gels, which we consider to be a little disingenuous, but the actual container carries a much larger stock than others on the market – with 90 servings per container. The actual price of this product is great, so the way that Bronson handles their product is far better than many others on the market. They provide a fantastic, reliable product that sits in our 2nd spot, easily beating all but the Sports Research Krill Oil! 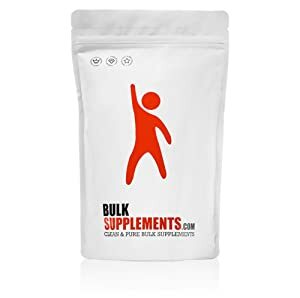 Bulk Supplements is usually a great company for providing a no-nonsense approach to supplements. While the choice of a bag for this product is questionable, the capsules themselves provide a decent supplement at a low cost. The use of a bag, rather than a rigid container, also increases the risk of serious capsule leakage. This is a common complaint and risks the use of all 300 capsules! The product count and cost are both great – as ever – but it’s relatively weak on astaxanthin content at 400mg, which may be a concern for its anti-illness or anti-aging effects. This can be counteracted through a balanced and effective diet, but takes a little extra effort compared to other products. With the risk of returning and re-ordering due to smashed capsules, we’re a little skeptical! Why would you put soft gels in a bag?! Many reports of broken capsules and ruined batches! They might be called MegaRed but there’s nothing mega about this product. The DHA concentration is far from ideal and requires roughly 3 capsules to compete with others on this list. While the EPA levels are relatively normal per capsule, the DHA is relatively low at 30mg, which places it in the lower ranks. This is the most difficult to consume/produce, so a reduced content here is a concern for the overall effectiveness of the product! The astaxanthin concentration is also incredibly weak, reducing the anti-aging, pro-health effect of this product. We would also like a better phospholipid content, since this effects binding/absorption, but this is less severe than our DHA concerns. Between these two, the MegaRed product fails at the fundamental functions of an effective Krill oil. There’s also no mention of sustainability, heavy metal content, or the reduction of persistent pollutants. These all add up to produce a krill oil supplement that misses out on all the virtues we saw with Sport Research, Bronson, or Onnit’s products. There’s very little to commend this distinctly not-mega product. You might have a general impression of what this product does based on these reviews! However, there’s more to Krill oil than you might think. This is a healthy fat supplement designed to provide a huge dose of Omega-3 fats. These are essential fats that are rarely contained in the necessary levels in your diet, which leaves a serious need for supplementation. Fortunately, krill oil is a great example of this with some of the densest concentrations of Omega-3 of any product on the market. 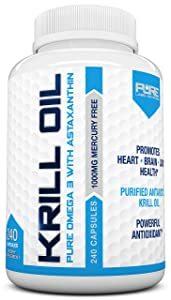 Krill oil supplements all the health benefits of regular fish oils with an environmentally-friendly profile and far less of the heavy metals often seen with larger seafood sources. Krill oil’s major benefits come from a few factors. We can split these into two key areas: Omega-3 density/availability and Astaxanthin content. These add up to easily provide some of the most sought-after and important health and performance benefits. Omega-3 fats are the most difficult to get of all of the dietary fats. They’re only found in a few plants, which don’t provide the right form, or in seafood. There are some found in cattle raised on a specific diet, but this doesn’t fit everyone’s diet, lifestyle, or wallet. Fish oil supplements are a common way of getting these key fats, but krill oil provides them in a more easily-absorbed form. As a result, you need around 66% as much krill oil as you might need to supplement from fish oils. This makes them an ideal source for health and wellbeing. Omega-3 fats are well regarded as being one of the best ways to support effective heart health. They provide improvements to blood cholesterol, support arterial health, and reduce the overall strain placed on the cardiovascular system. They are also likely to improve – or at least support – mental and brain health (though we’re still waiting on some better studies). These are key concerns for problems like depression and anxiety, which are common mood disorders. Omega-3 intake is closely correlated with mental health problems and seem to reduce overall risks. There are distinct benefits to a krill oil supplement and its omega-3s for sport performance. They’re long-favorites of athletes, since Omega-3 fats are anti-inflammatory and can reduce the risk of exercise-related stress. If you can get optimal levels of Omega-3, you can improve your response to exercise and support the health of muscles, connective tissues, and joints. They can also reduce psychological stress, which interacts closely with the way your body recovers. Basically, putting these two together promotes well-rounded, effective recovery from the stresses of exercise and life. These aren’t just for elite athletes: you can make serious benefit of these compounds for your own recovery and wellbeing! Astaxanthins are a form of incredibly potent antioxidant found in krill oil. It’s very potent and has significant benefits in preventing age-related cellular damage, breakdown, and death. As with other antioxidants, this is going to provide some support in reducing the risk of dangers around mutations, cancer, aging, and degradation processes. 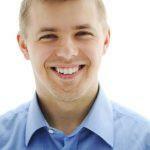 This means a better defense against chronic disease and the ravages of time. It’s closely related to carotenoids – the family of antioxidants surrounding vitamin A. These are specifically useful for your eyes, where they reduce the risk of macular degeneration and age-related visual impairment. There are a few key areas that will make or break your Krill oil. 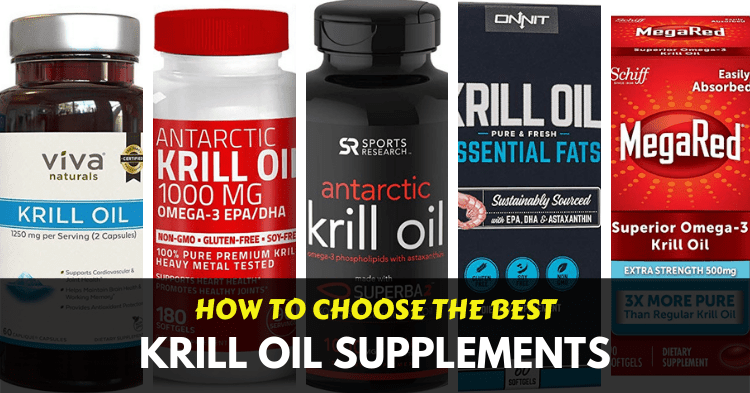 You’ve seen them above, but if you’re still looking for krill oil products you need to follow these crucial guidelines. This is as simple as it gets. 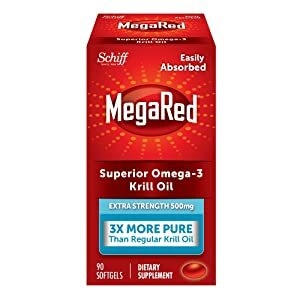 There’s no point taking a krill oil product if you’re not going to actually get any of the crucial Omega-3 fats. Specifically, the EPA/DHA content provides all the benefits we just discussed, so the more you get the better the product is likely to be. These support your brain, heart, and reduce overall inflammation to support performance and wellbeing. We look for an average dose/serving of 200mg. There are products with more DHA, which make for the best products, but EPA is also crucial for the best health, so the combined total is a good place to start! This is secondary to your Omega-3 content, but it’s going to be important still. The best products provide 1mg, while many of the lower-quality products are only packing a few hundred mcg. This isn’t enough to make a lower-Omega-3 product better, but if you’re looking at products with a similar EPA/DHA content, the higher astaxanthin is better. The benefits of this compound are primarily effective for health and wellbeing, which makes them less relevant to performance but important for everyone! This is always relevant. Especially when we consider the cost per count – how much you pay per serving. This means that you want a lower overall price, but also a higher count of capsules and less capsules per serving. There are many products that provide counts of over 100 capsules but – like MegaRed – require 3 capsules to be taken to keep the potency competitive. Concerning heavy metals in seafood include mercury, lead, arsenic, and cadmium. Too many of these in your diet can quickly add up and begin to cause serious health risks. A good krill oil product will provide you with a minimal dose, especially if you have to take several capsules. Products that don’t mention these heavy metals are worth avoiding, while those who actively publicize their low levels are worth looking at. Aside from the heavy metals, PCBs and dioxins are a real risk if you’re not careful with them. These are pollutants that persist in the Krill themselves. A manufacturer that takes care to reduce the presence of these in your diet is preferable. This is about the quality of your food sources – an important factor in health and wellbeing. The fishing practices that underwrite your foods are best when they’re sustainable. The krill population is enormous but companies that provide a sustainably caught krill supply means that there’s plenty for the future. MSC and Friends of the Sea certifications are a step towards this. Ideally, krill oil products should be good for you and the planet. The way you use krill oil is going to be similar to other omega-3 products. You should be taking 1-2 capsules at least once a day, depending on your exercise and health needs. There are no real significant side-effects to supplementation – it’s just like eating food – so you should be fine. If you have a seafood allergy then obviously you need to avoid krill oil. There are some small interactions with other medications you may need to watch out for, too. We suggest checking with your medical professional before taking krill oil just for additional peace of mind and to check with your prescription medications. On the other hand, krill oil is synergistic with a number of fat-soluble vitamins. We recommend consuming your krill oil capsules with a light meal that is rich in vitamins and minerals. Our clear favorite is the Sports Research Antarctic krill oil. It provides a potency that is worth your time, rich in EPA/DHA, and is sourced with sustainability and pollutants in mind. This product provides assurances at every level with effective 3rd party testing and ensures minimal concentrations of heavy metals or persistent pollutants. This is everything we could want in a krill oil supplement! We also like Bronson for their product and the care they take to reduce mercury levels. The effective dosing and pro-active approach to FDA manufacturing practices puts them solidly into our “runner up” category. Bronson provides a good budget alternative that doesn’t provide the same ethical/pollutant assurances, but has good manufacturing practices and effective doses. Overall, krill oil supplements are no different from any other kind of supplement. They require effective doses that are able to be absorbed and effective secondary compounds that assist your health. What we do see with these compounds is that the better brands and products are those that back up their claims, seek to show off their ingredients, and put consumer needs at the center of their product. This is why we love the Sports Research Krill oil, and it’s the standard of transparency and accountability we want from all supplements. You deserve products that do what they say and bring the results you want!